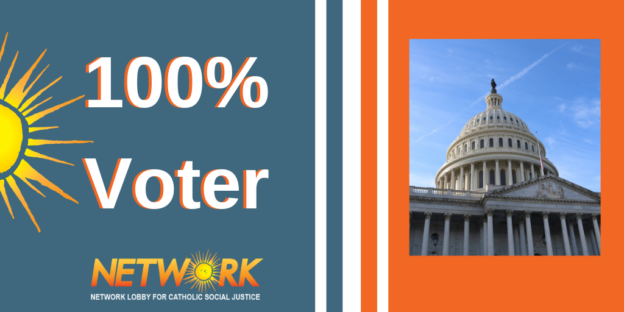 WASHINGTON, D.C. – Today NETWORK Lobby for Catholic Social Justice announced the release of its 2018 Catholic Social Justice Voting Record. This annual scorecard reflects how Members of Congress voted in accordance with Catholic Social Justice and evaluates if they worked to mend the gaps in economic and wealth inequality. “The second year of the Republican-led 115th Congress was another year of chaos and struggle. The Trump administration doubled down on tax breaks for the wealthy, cuts to human needs programs, and relentless attacks on immigrants and asylum seekers. Catholic Sisters and activists struggled tirelessly against these proposals. The Republicans in Congress decided to follow the President’s lead and support this barrage on the common good, and they paid the price on Election Day. “The voters rejected incumbents and embraced those who defend the common good. These defenders of the common good are reflected in our 2018 Catholic Social Justice Voting Record. In 2018, NETWORK Lobby prioritized the most important votes from the past year that fit with its 2020 policy vision to Mend the Gaps. NETWORK Lobby scored 15 votes, eight in the Senate and seven in the House. We recommended nine ‘No’ votes on bills that attacked immigrants, cut healthcare and food assistance, and doubled down on the harmful effects of the 2017 GOP Tax Law. NETWORK Lobby recommended six ‘Yes’ votes on bills that protected Dreamers, ensured food security, and took the first steps toward broad criminal justice reform. Last year, seven state delegations received perfect Catholic Social Justice voting scores: Connecticut, Delaware, Hawaii, Massachusetts, New Hampshire, Rhode Island, and Vermont. Every single House and Senate member from these states voted 100% of the time with in accordance with NETWORK Lobby’s Catholic Social Justice values. There were also four states that had their entire delegations fail on their Catholic Social Justice Scorecards, receiving scores below 70% in 2018. Every single member of the Arkansas, Kansas, Utah, and West Virginia delegations consistently voted against the recommendation of the Catholic Sisters and activists of NETWORK Lobby. NETWORK Lobby members will be contacting their members regarding their 2018 Catholic Social Justice Scores. This entry was posted in Front Page, News Item on February 11, 2019 by Lee.